Some blog owners use email, to distribute blog content - and like the post summarisation technique, Jump Break. We see occasional hopeful questions, in Blogger Help Forum: Learn More About Blogger, about Jump Break, in emailed post content. How do I use Jump Break, in my posts email subscriptions? This is one need that probably won't be solved, precisely as requested. Jump Break is simple enough, to add to the blog - one post at a time. To work, from an index page, it needs 2 components. A summarised post segment, with the "Jump Break" token, <!--more-->, in the index page display. A post, with the "more" anchor embedded. The "Read More" target URL is easy enough to pass, and to use, in email. Here's the "Read more" URL, from a previous post. The Jump Break token isn't easily interpreted, outside the Blogger environment. But you can use an alternate "Read More" feature. 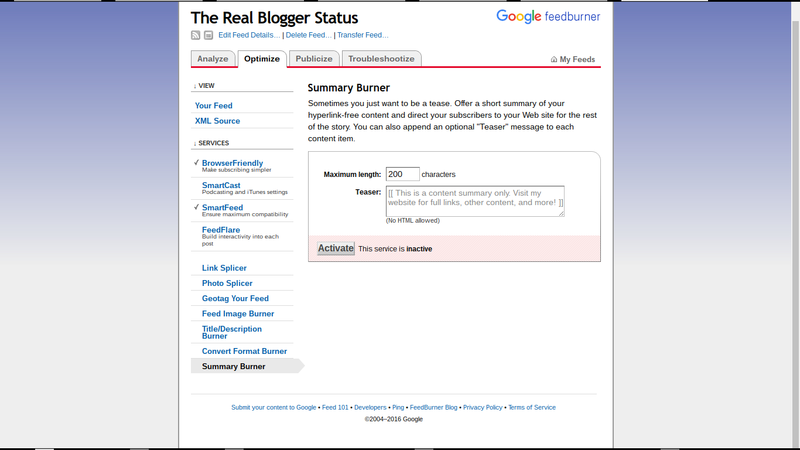 If the blog can use FeedBurner Email Distribution, however, you can get FeedBurner to format a post summary. A post summary uses a truncated "teaser" post, truncated before the post is distributed - instead of Jump Break, interpreted when the post is viewed. There are 2 possible ways to use "Read More", instead of "Jump Break". You have 2 possible solutions here. Setup a FeedBurner feed, based on the feed summary. 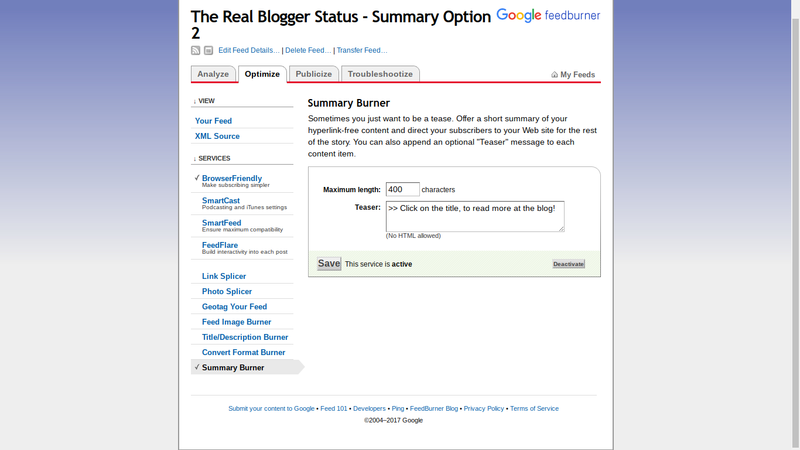 Setup a FeedBurner feed, based on the full feed - and use the Summary Burner option. I setup 2 test feeds, from this blog. The Real Blogger Status - Summary Option 1. 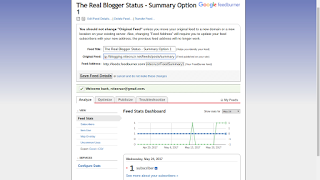 The Real Blogger Status - Summary Option 2. You may click on either or both - and examine / compare the results. The first is based on the summary posts newsfeed, as coming from this blog, and simply redistributed by FeedBurner - and the second is based on the full posts newsfeed, as coming from this blog, and summarised then redistributed by FeedBurner. You may subscribe to either, or both, feeds - and see what you get, in your Inbox. 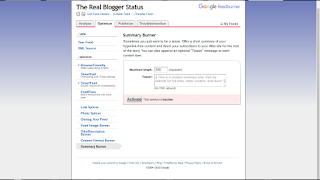 Subscribe to The Real Blogger Status - Summary Option 1 by Email. 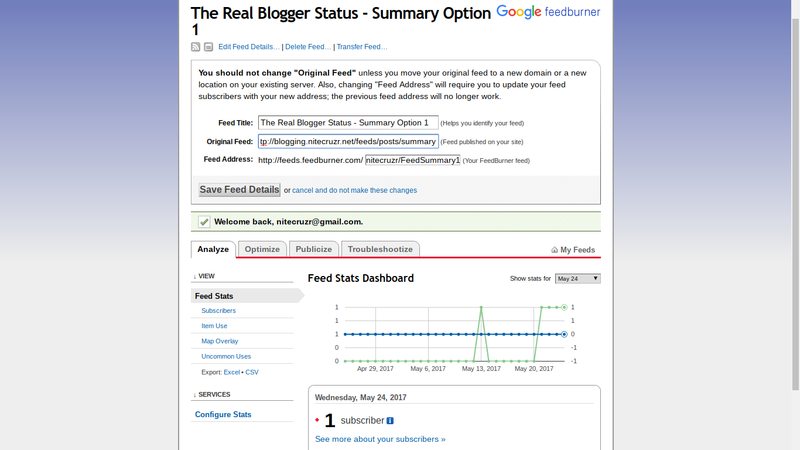 Subscribe to The Real Blogger Status - Summary Option 2 by Email. Both "Read More" solutions are easy enough to setup, using FeedBurner. Setting both feeds up was rather simple. The "Feed Summary" solution is simply a standard FeedBurner Email Distribution, sourced from "/feeds/posts/summary". 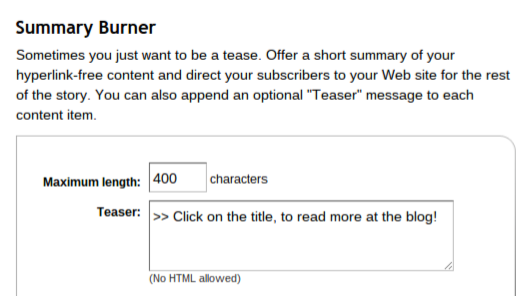 The "Summary Burner" option is simply a standard FeedBurner Email Distribution, sourced from "/feeds/posts/full" - and "Summary Burner" activated, with a "teaser" of 400 characters. To use Option #1, use the Blogger "Summary" feed. To use the Summary feed, use "Edit Deed Details", and change "Original Feed". Use "Edit Feed Details" - and change "Original Feed". To use Option #2, activate "Summary Burner". 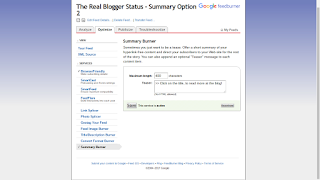 Activate Summary Burner from the Optimize tab. With Summary Burner activated, you can select the "teaser" length, in characters. 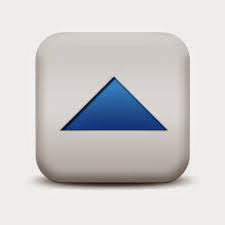 You activate the "Summary Burner" service, from the dashboard Optimize tab. If necessary, setup a second FeedBurner feed. Option 2 (Summary Burner) lets you adjust the "teaser", and the caption. That's the only choices - and the only challenge. 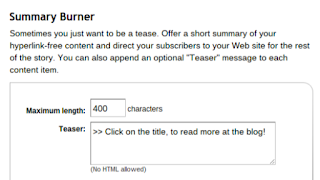 If you compare the two options, you'll notice that Option 1 is simply a fixed "teaser" of 400 characters - and that Option 2 gives you an adjustable "teaser", plus a caption of your choice. With both options, the link to the full post is in the post title. So, it's a toss up. I'd probably go with option 2, which is more adjustable - but it's your choice, for your blog. It takes less than a minute, to change from one to the other. I subscribed for both of them to see how it looks like. However, I discovered a major problem thanks to this. When you subscribe, it sends an activation link to your email. But this goes to SPAM email folder. That explains my 17 unactivated subscribers(only 5 activated). Is there any way to solve this? Or is there any alternative? Thanks for asking, this is not an unusual problem. Hoping that your email service has trainable filters, you need to mark the activation link email message as "Not Spam" and / or move it to your Inbox.